Latest Track Outing – Snetterton Wednesday 28th May. A quick shakedown at Javelin’s (www.javelintrackdays.co.uk) recent Track Evening at Snetterton on the 300 circuit. Once the pads were fully bedded after a few laps in the car performed faultlessly, the extra power proving more than useful. The tyres were good too, and as a value for money tyre performed very well indeed, and if I am honest better than expected, but at £108 per tyre it is hard to fault them. After a little over 2,000 miles the first set of RS29’s are now somewhat past their best and with a track evening coming up a new set are in order. Upon visual inspection there appeared to be just about enough ‘meat’ left on them for an evening track session, but upon closer inspection it was much more obvious that they were in need of replacement. Replacing these ones which have certainly been put to work! And when the pads were fitted Cera Tec was used where required in place of the usually chosen copperslip, mainly due to its high heat resistance. Cera Tec is a metal-free high temperature resistant (up to 1000° C) anti-squeal lubricant for braking systems. Easier to apply and much less messy than the alternatives! On the rolling road over the last few days for final mapping and optimisation, with 99 Octane fuel in the tank. This was to map the ecu to take advantage of the new inlet manifold, steel rods and the K06 turbocharger to make sure fuelling, ignition timing and boost pressure were all correctly optimised. Too lean and Exhaust Gas Temperatures (EGTs) and Cylinder Head Temperatures become too high potentially causing the exhaust manifold to crack, or cause a spark plug tip to fail and burn off or worst case scenario a piston could melt. Too rich will kill power and cause possible bore wash leading to premature internal wear. The ignition timing needs to be optimised to be as advanced as possible for maximum power gains, but without instigating any knock retard due to detonation, which again will cause running issues and eat into the ecu’s safety margin, especially when driven hard on track. When the car was again mapped back in June 2012, after I had made the first changes to the car the engine was producing good Stage 3 power and torque of 292bhp with 342lb ft torque (290bhp and 336lb ft on another run), with ignition timing, knock retard and fuelling all correct and safe which made the car very useable on track and road. Last time the car was checked on the rolling road during 2013 it achieved 300bhp during an unloaded run, although running a little leaner due to the lack of load. Now the ecu is being mapped to suit the new spec. With a base map configuration for the new set up the improvement was to 327bhp, however the engine was running far too lean through the mid range, then richening up above 5,000rpm so this fuelling certainly needed addressing. A quick adjustment to the actuator was made to alter the break off pressure, further rolling road runs were made to check fuelling, boost and ignition and all the relevant changes were made to the software after consulting the data logging output. This final mapping session with mapping changes has produced a very healthy 336bhp and 355lb ft torque (repeated on two back to back loaded runs) and even after several hot runs (heat being a big issue with turbocharged cars – they hate it and it is kills power) the engine produces around 328-330bhp, so very good for a 90,000 mile engine. For the next track day outing I have been sent a set of tyres to evaluate, and they arrived bright and early this morning. Whilst the name might be one that most people would be prepared to shy away from, the Nankang NS-2R is on the RAC MSA Blue Book Tyre List 1B, which is the RAC MSA approved list for Sports/Uprated tyres suitable for competition. These are the 180 Treadwear tyre and at a respectable £108 a corner they are worthy of consideration. I had a similar experience with some Hankook RS-2 tyres – again an RAC MSA List 1B tyre, an excellent dry weather tyre (more grip than the ‘average’ road tyre), and great in the wet – very progressive. Sadly they are no longer produced and they were not sold in huge numbers, mainly I suspect down to people being unsure of the name. However now Hankook are now OE to several respectable vehicle manufacturers. Not expecting them to be as sticky as a cut-slick type of tyre, but if they prove to be a good track day tyre covering dry and wet conditions, similar to other tyres of this type then they will be well worth the money. UHP tyre with two grip level options for Fast Road/Track Day (Treadwear 180) or Sprint Use (Treadwear 120). Exceptional high-speed stability and wet weather performance plus cornering precision and grip. Used as the control tyre in the 2014 Fun Cup series. The three main circumferential grooves on central tread can improve drainage efficiency and wet handling performance. Unique groove wall angle design can prevent excessive stress massing to restrain irregular treadwear effectively. Continuous tread shoulder design can improve tire stiffness and ensure cornering grip. Optimized tread width design (contact patch wider 13% than regular tire design) improved stability while driving at high speed. Large block design on tread shoulder upgrade stiffness and cornering handling performance. 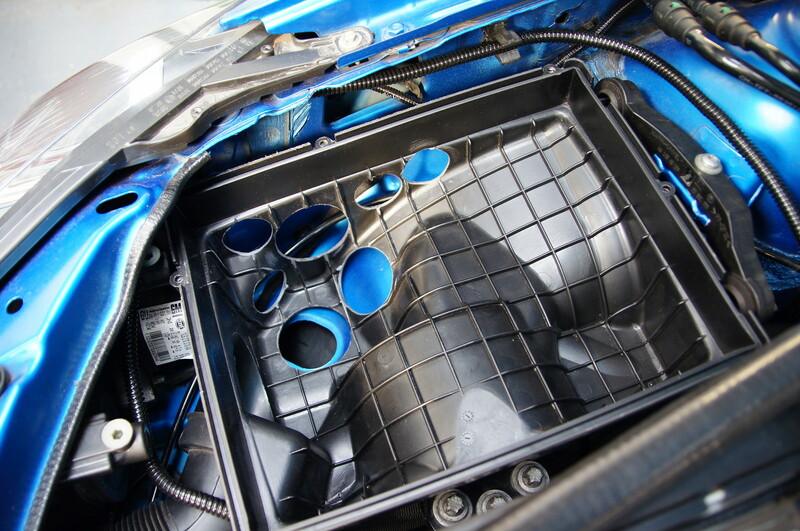 To help with air flow, yet retaining the ‘direct route’ Astra CDTi air box, some porting of the lower part of the box has been carried out. At the bottom there is a large hole which lines up with a hole in the inner wing to help draw in more fresh air, plus some additional holes to the side away from the heat of the engine bay and turbo, again to help maximise airflow. Stumbled across these Loctite thread locking guides online. There are so many different types, this covers them and which type should be used where. Useful for reference, however the most used will be 243 Blue Medium Strength (UK/USA) and 263 Red High Strength (USA), the UK equivalent to 263 is 270 Green High Strength. …..and the odd teething trouble! Today the front bumper was refitted ready for the first road test after the winter’s rework. Really just an opportunity to have a brief shakedown and check engine oil and gearbox oil coolers and temperatures. After the fuel pressure was adjusted using a new 4 bar regulator, the ecu was mapped and a brief check on the rolling road showed a safe but not fully optimised map giving a ‘useful’ 327bhp. On the road the car wasn’t driven in anger as the mapping has not yet been fully optimised, but it was instantly apparent that the power and torque gains are massive across the whole rev range. Even driven at ¾ throttle the acceleration is immense, compared to a Stage 3 300bhp car and the transformation is unbelievable. You have to experience it to fully appreciate it. It was also an ideal opportunity to check the new engine and gearbox oil coolers. The engine oil cooler and temperature all seemed fine. Gearbox oil temperature rose to about 73 degrees C so it was time to try the new oil cooler. Back at base the switch was flicked on……. Nothing! No pump noise, no green LED to indicate power to the pump. Very strange as I had checked, double checked and triple checked all the wiring before everything went back together. So it was time to do a bit of investigative diagnostics. The first thing was to put a live feed from the battery to the switch feed on the relay; this would power up the pump and check if the issue was a faulty pump or something to do with the switched side of the wiring. So on investigating the relay, ready to put some power to the switched terminal, it became immediately apparent that one of the relay earth connectors had pushed back out of the relay housing…… that would do it!!! Carefully pushed it back into the relay housing and refitted the relay. Bingo! LED illuminated and gearbox oil pump whiring quietly to itself. Fantastic because I was convinced there were no wiring issues, so a misconnected relay pin was a simple fix. And dare I say it easy to overlook when the relay was originally pushed into the housing. Upon further checking round I then noticed a very slight weep from the banjo union back into the top of the gearbox, despite being sealed with copper washers. Clearly the face on top of the gearbox isn’t quite 100% square. So plan B for this union…. None of the other oil fittings using the same banjos and banjo bolts was leaking. So to get at this union it was a case of quickly popping out the battery and bracket – it all comes out as one unit once the three bolts are removed and the battery clamps are disconnected – nice and straight forward now, unlike with a factory battery and battery tray. Unscrew the banjo bolt and clean everything down using degreaser. Refit with a pair of dowty washers which incorporating a rubber seal as well should seal better onto the gearbox face. This was in place of the copper washers which were originally used, despite the fact the chosen copper washers are the same as the ones used on the turbo oil drain to the block. Once all back together, flick the pump back on. The moment of truth…… sorted. Pump fully operational as before and oil flow back into the gearbox……. and no leaks. So next it will be onto finalising the mapping, and an overdue wash and detail. And a new set of Pagid RS29 brake pads for the front alcon calipers and a new set of tyres.